I feel like this has been posted before, but I can't find the thread. On the "Geocaches" tab of my profile, under Geocaches Found, there is total count for "Traditional Geocache". 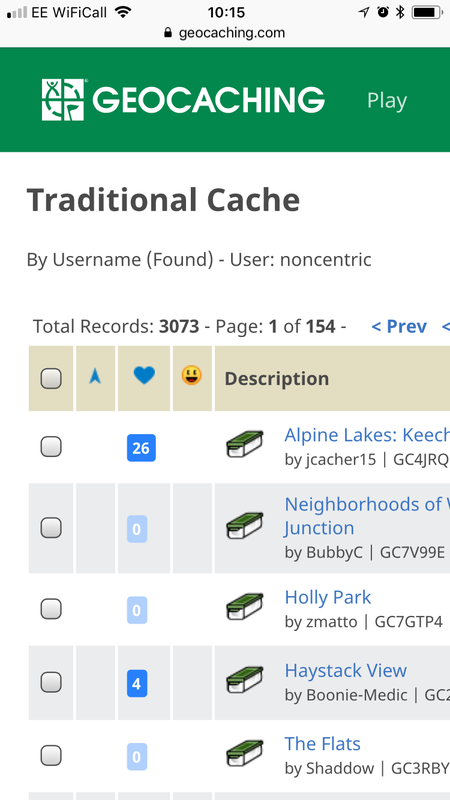 When I click on "Traditional Geocache" and it takes me to the paginated listing of those Trad caches, then the count for "Total Records" is one less. The same happens if I click on "All Geocache Finds". The paginated listing of my found caches shows 1 less than the total (minus Lab Caches) shown on the "Geocaches" tab of my profile. I can't figure out which cache is missing. No cache is 'missing' from a MyFinds PQ, just from the paginated listing of found caches. I noticed the discrepancy a few days ago and thought it would correct itself after I logged a few more finds, but am still noticing the issue. There have been a couple of mentions recently of incorrect ‘owned’ counts so this intrigued me. Checked my own ‘find’ counts: no problem. Checked yours: no problem either - looks like it has corrected itself. I see 3073 Trads on the summary table, which matches the Total Record count when you drill down. Same for all finds. Out of interest, when you go to the last page for your Trads, how many caches do you see? Do you see 12 (for the 3072 total) or 13? One possible cause for this is if a geocacher logs multiple finds on the same cache. But, that isn't possible anymore. Another cause is if one of the found caches was retracted. But, it would be highly unusual to retract a cache that people have logged finds on. I see the "correct" numbers. Could it be a "browser cookies" thing? If you have a different count, one cache is gone from the list. It would be good to know which one it is. You could run a My Finds Pocket Query and process it somehow. But the immediate ideas I thought of may not work. For example, "Project-GC" can do a decent cache count, but it's also "another user", and the count is fine for other users. It's also possible, as Keystone noted, that there is a change that caused the number to decrease by one, and that what you see is the new total, and the numbers have not caught up. If that's the case, it's a lot like that other thread. Here's a recent thread about an inaccurate "Geocache Owned" total, but it shows a similar math effect. It's apparently a server issue that is not clearing up. I don't want to alarm anybody, but the weekend starts tomorrow. I might consider pre-loading my weekend caches today. Just sayin. Is one of the caches on your ignore list? I too see the correct count, whether viewing old or new profile. The list of caches found is unique caches - If you have find of retracted, or logged two or more Found it! on the same cache, that list will come up short. but the list of found trads is 4365. Also "ignore" a cache can do some very weird things in terms of how the site displays. Thanks Moun10Bike! Yep, that was it. Mystery solved. Not sure why I had a cache on my Ignore List in the first place. Must've been experimenting with something and forgot to delete it. I just now set my own Mystery cache to "Ignore" (! ), and although the list of Mystery caches now shows "7", the summary correctly shows "8". So "Ignore" behaves a little differently depending on the list, hides or finds. Or else it takes a while to catch up. I'm not excited enough about it to risk totally scrambling things. Gonna go unignore now. I just ignore the ignore function. You know, in order reverse the change to "Unignore", the link to click is "Ignore". I was greatly concerned that I had locked "Ignore" permanently, or at least would have to get special help to fix it. I already permanently destroyed part of my Forum Settings by clicking things. This place is tough on people who like to click buttons.